It's Barbeque season and, although the weather has been rather variable, when the sun shines we love to cook and eat outside. Some hardy souls even brave the rain and wind and carry on regardless. Here are a few of the products that have arrived on my kitchen table for review and how I think they can be served as part of al fresco eating. Let's start with some soup! "Soup at a Barbeque!" I hear you cry, well yes... ideal for those days that are not quite warm enough and also perfect to keep hunger pangs at bay while the barbie is heating up and the main event is cooking. This healthy Glorious Skinnylicious Soup is perfect to start your party. 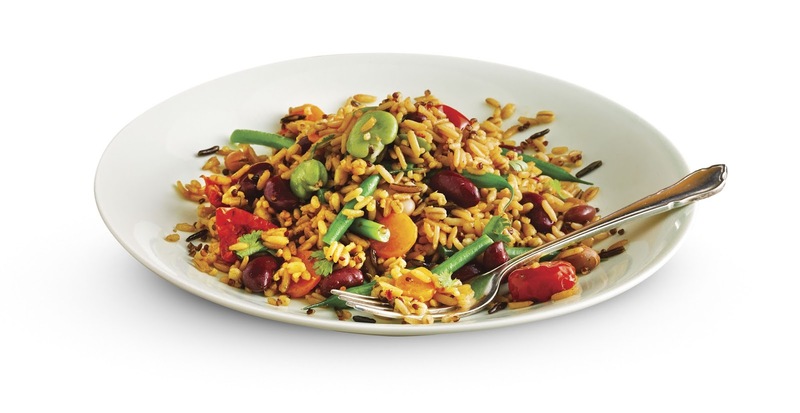 The San Antonio Fiesta is a hearty chilli sin carne with Black eye beans, Haricot beans, Black Turtle beans, and Red kidney beans. Also carrot, red pepper, basmati rice, a smoky Chipotle chilli paste, a pinch of peering at colourful floats parading past and ending the night shamelessly line-dancing in an old dancehall. 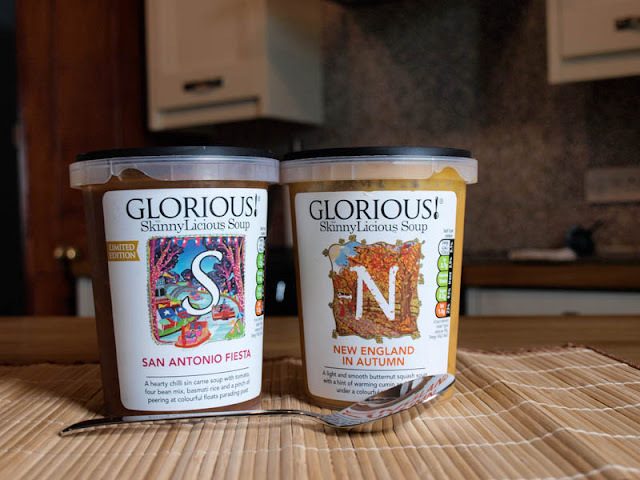 For those who prefer something a little smoother and sweeter there is New England in Autumn and it certainly doesn't taste like it has less than 1% fat. Made from roasted butternut squash with a hint of warming cumin, this soup reminds us of happening upon honesty stalls full of autumn harvests and strolling under colourful tree canopies. Kids will love this too. Now, you can't have a barbeque without burgers. 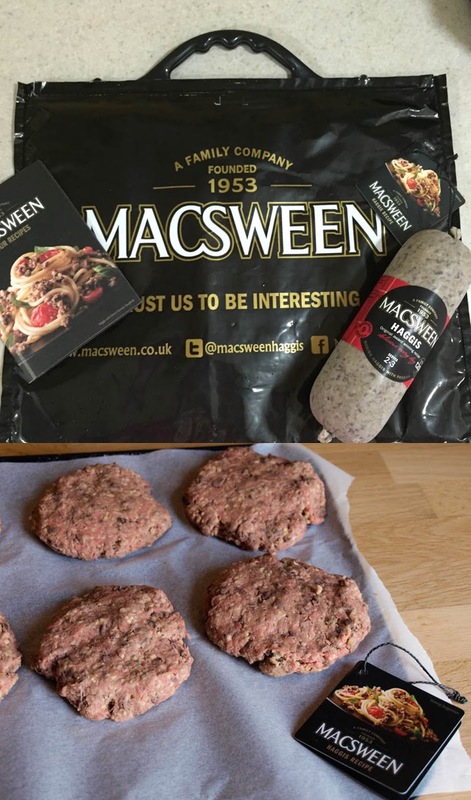 These are a little different, they are haggis burgers which I made by combining 500g of beef mince and 450g Macsween Haggis, then forming into patties. Chill and then cook in the usual way on the barbeque or fry them, cook under the grill or bake in the oven. Serve with salad, homemade coleslaw and homemade potato wedges. To dress up your burgers, sausages or steaks you need some spicy sauce or a tasty marinade. 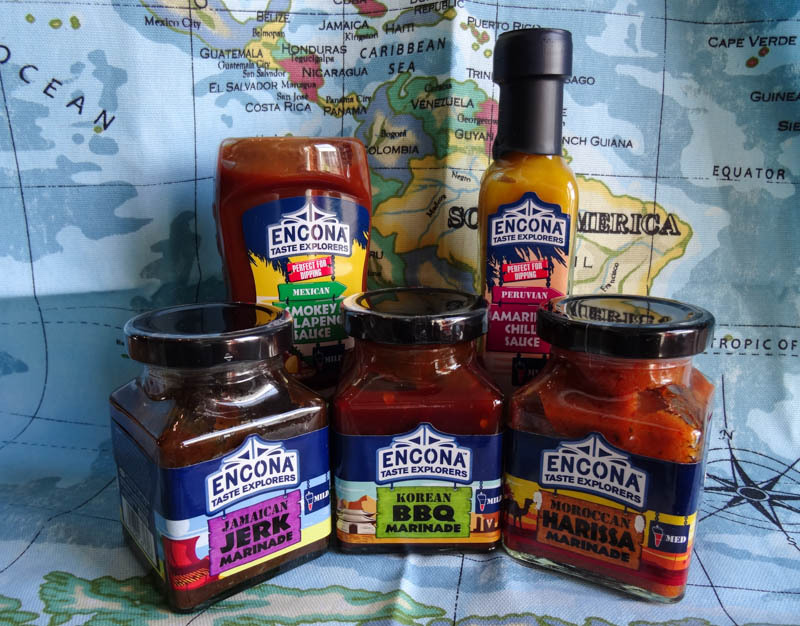 Encona Taste Explorers have a great range of sauces and marinades provide something a little different, how often do you taste Jamaica, Korea or Morocco on the grill? With Encona’s new marinade range, you can spice up your barbeque and bring flavour to the fire. 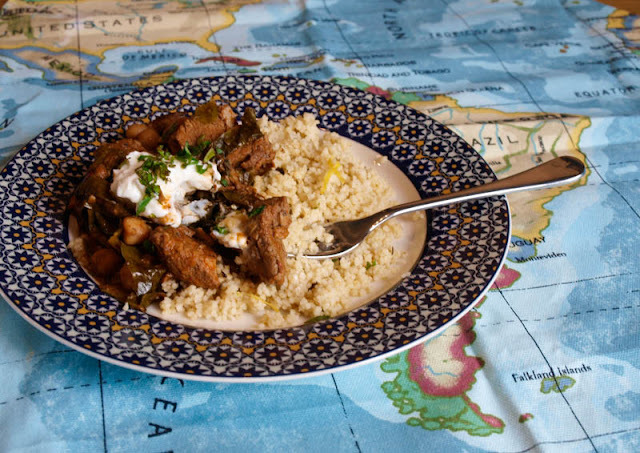 You have a choice immersing your food in Jamaican Jerk, Korean BBQ or Moroccan Harissa. Each marinade has been inspired by its origin, combining authentic ingredients to create three mouth-watering marinades that will make you feel like you are sunning in the Caribbean, riding a camel in North Africa or wandering through Gwangjang market. A spicy and fragrant Moroccan paste made with a blend of chilli puree, herbs and spices; the harissa marinade adds the perfect kick to a lamb skewer. For those who feel taste travelling to Morocco isn’t far enough, you can take your taste buds all the way to Korea. The BBQ marinade is made with a blend of gochujang spices, which can be enjoyed on beef, chicken, pork or grilled vegetables. Alternatively, you could virtually hop across the pond to the sandy beaches of Jamaica, and enjoy a beach BBQ with a mild jerk marinade blended with scallions, hot pepper and pimento spices. Each marinade is suitable for vegetarians and two are gluten free. Time to get saucy with Encona Peruvian Amarillo Sauce, a blend of authentic Peruvian Amarillo chillies, roasted onion, spices and herbs creating a sweet, subtle chilli flavour with a hint of garlic – the perfect way for eager taste explorers to get their taste buds tingling without the cost of a plane ticket. Grab your maracas and sombreros, Encona are taking us to Mexico too. Launching alongside their Peruvian sauce, they have created a Mexican Smokey Jalapeno Sauce. A delicious blend of chillies and spices gives the rich sauce a subtle smokey flavour and a warm and fruity taste to compliment your Mexican meals. These are really versatile sauces, not just for the barbeque. I added the Moroccan Harissa Marinade to some lamb steaks and cooked for 8 hours on low in the slow cooker, throwing in a drained can of chickpeas about an hour before serving. The result was a delicious spicy tagine-style casserole served with lemon zest couscous. A big pot of this would go down well with fans of spicy food. I have a hamper of Encona goodies including the full new range and a cute handmade World Map apron to GIVEAWAY, see bottom of this page. And for the vegetarians attending the barbeque, I would recommend this delicious Grilled Halloumi, Red Pepper and Rocket with Wholegrain, Pearl Wheat and Quinoa, using one of the new range of Rice and Grains pouches from Uncle Ben's. They are so quick and easy, ideal when you are pushed for time and still full of flavour. Heat a non-stick frying pan or griddle pan. Cut halloumi into 6-8 slices and cook quickly on each side for 2 mins until lightly tinged brown. Squeeze Wholegrain, Pearl Wheat and Quinoa pouch to separate the rice, tear 3 cms to vent, then microwave on full power for 90 seconds. 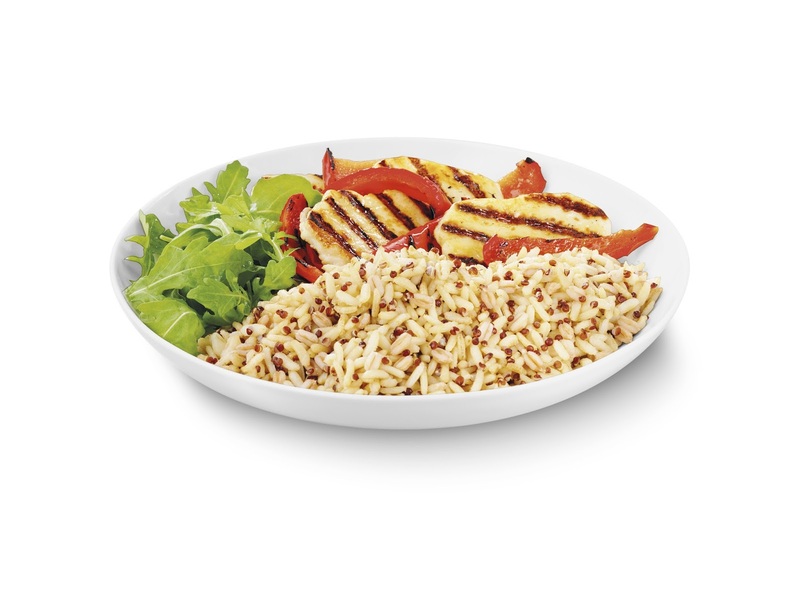 Arrange rice, halloumi and salad on plate. Garnish with slices of red pepper and a few pine nuts. 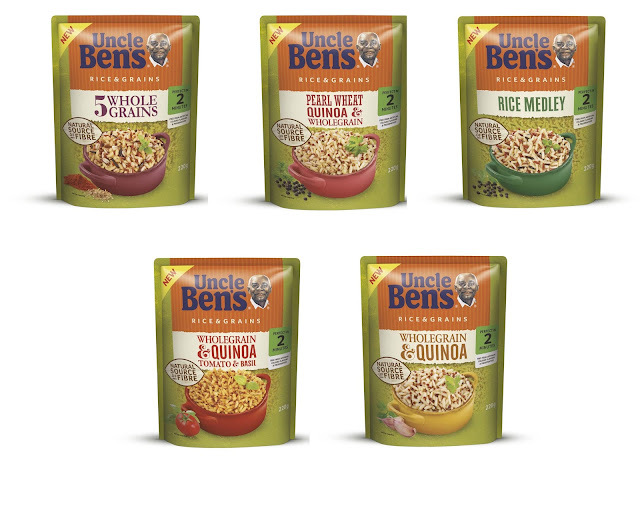 This is the full range of Uncle Ben’s wholesome, great-tasting Rice and Grain varieties Perfect as a base for a healthy summer meal, each pack blends the goodness of wholegrain rice with added grains such as quinoa, wild rice or pearl wheat. 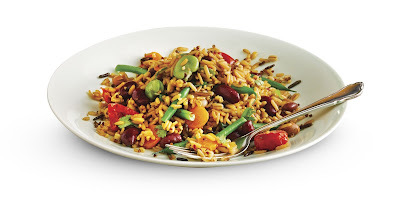 Everyone will all enjoy this Mixed Bean and 5 Wholegrains Salad and there are plenty more quick and healthy recipes on the Uncle Ben's website. 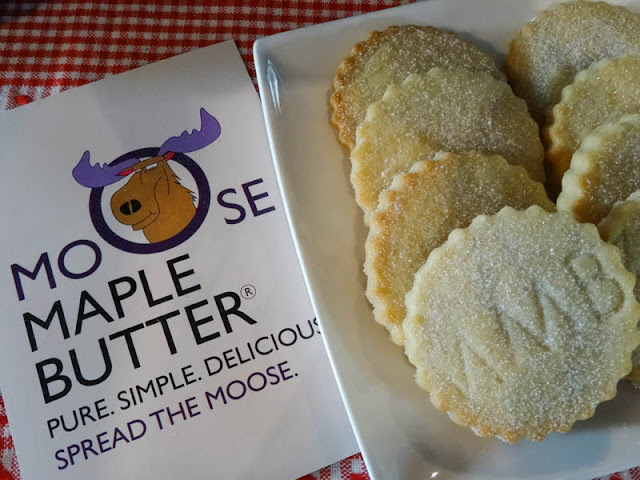 These Moose Maple Butter shortbreads are the perfect grab and go dessert, they are made to a simple shortbread recipe, the Moose Maple Butter gives them a slightly chewy,cookie texture rather than the usual crisp shortbread, the flavour of maple comes shining through, not overpowering but deliciously rich and sweet. Moose Maple Butter contains nothing more than Pure No.1 Canadian Maple Syrup and fresh British Butter and a pinch of salt, it's great spread on toast, it's a great alternative to other sweet spreads, we loved it. Finally treat your guests to the traditional Elizabeth Shaw Mint Crisps. This timeless recipe is made with quality dark chocolate, infused with mint oil and blended with a unique, melt-in-the-mouth honeycomb crisp. 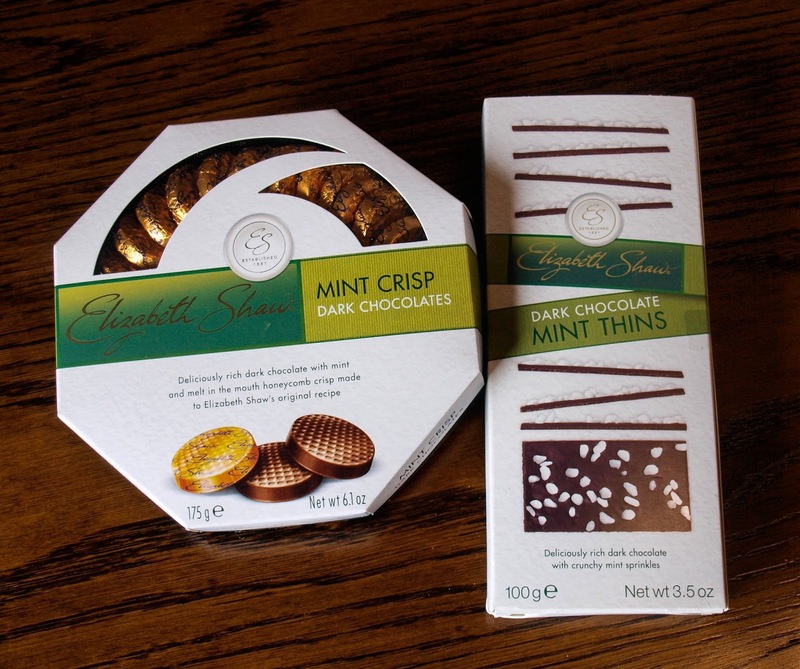 Or you could introduce the latest mint creation from Elizabeth Shaw: Dark Chocolate Mint Thins. Delicate layers of quality dark chocolate infused with a sumptuous mint flavour, luxuriously decorated with crunchy mint sprinkles. The lightness of the chocolate with the crunchy sprinkles makes them very moreish indeed and although these are great to share with friends over a coffee, you may find you want to keep these all to yourself! 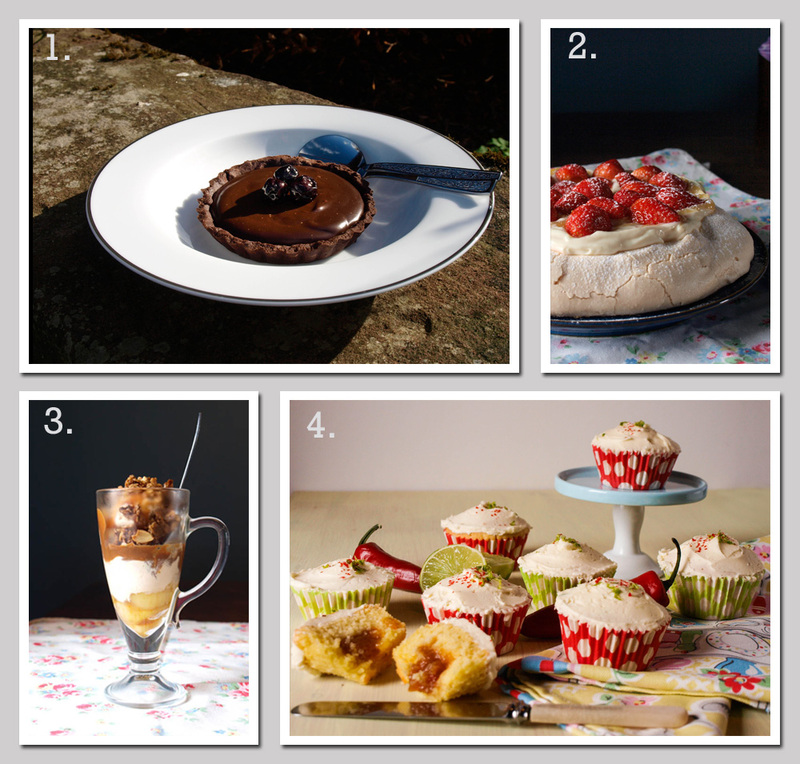 I hope you've enjoyed this little barbeque round up and remember to enter the competition (UK only) to WIN a hamper of Encona sauce and marinade goodies by completing the Rafflecopter widget below. I was provided with samples to review, all opinions are my own. Chicken thighs are great but there is always the worry whether they are cooked!! Chicken, and I love barbecued corn on the cob! CHORIZO on a bbq! omg its delicious!! Honey glazed ribs without any semblance of doubt! I love food!!! would love to try all!!! 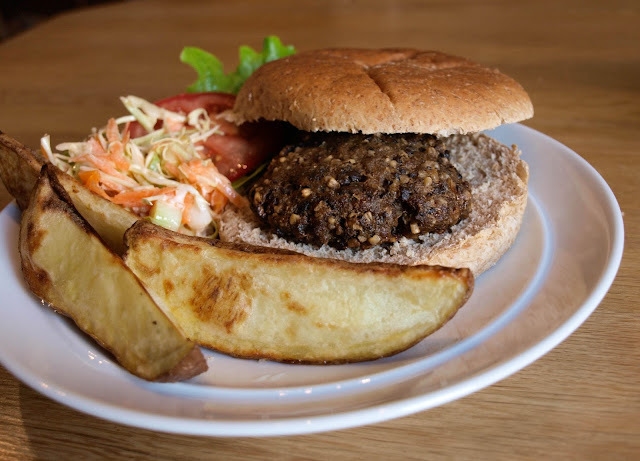 Can't beat a classic beef burger. Pork chops with veggie kebabs. Definitely the simple barbecued sausage sandwich! I love lamb and halloumi kebabs, so good! Corn on the cobs with a honey, chilli and balsamic marinade. It has to be a classic, big, meaty hot dog for me! I love spatchcocked chicken, it cooks evenly and doesn't dry out. Lamb and Mint burgers or Chicken and Halloumi Kebabs. A classic cheeseburger with plenty of onions! I'm so impressed by some of the delicious BBQ choices you are making - Good Luck everyone. Cheeseburger - a classic for a reason! I have a pizza oven attachment that goes on the top of my kettle barbecue. So my fav bbq food is smokey, crispy, barbecued pizza. Current fav topping is chargrilled chicken, roquito peppers and chillies. Can't beat hallumi cheese on the bbq! Prawn & vegetable skewers with a tasty glaze! I personally love a cheese burger !